FORT SHAFTER, HAWAII. 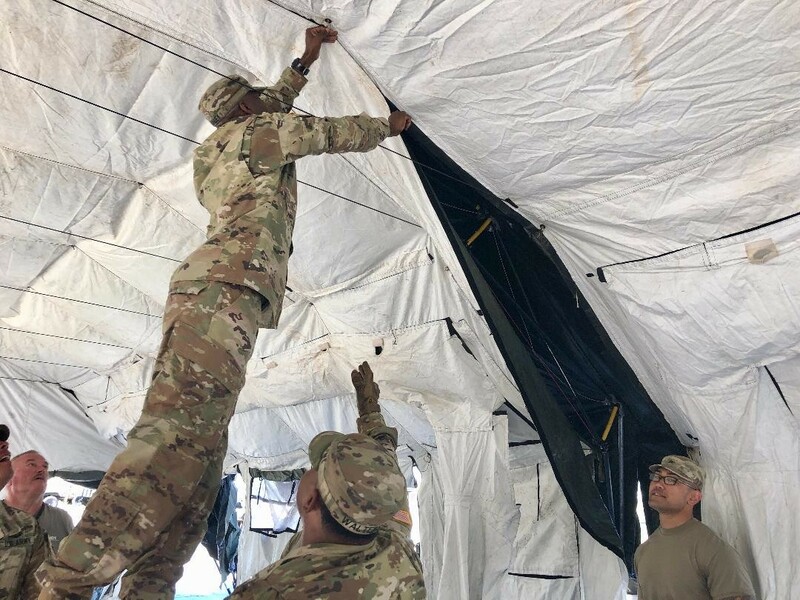 --Soldiers with the 8th Theater Sustainment Command came together for training on the set up, systems validation and tear down of their operational command post, Jan.7-11, to help maintain the command's wartime readiness by focusing on their expeditionary capabilities. "This training is essential because it helps us to identify shortages not only in equipment but in our knowledge base," said Sgt. Maj. Geoffrey Dean, the 8th TSC Operations Sergeant Major. "Figuring out our shortages when it's time to deploy is not the right time, so we must ensure that we are training our Soldiers to be ready to fight tonight." The most labor-intensive part of the training is the set up and tear down of the HDT Base X-Shelters. 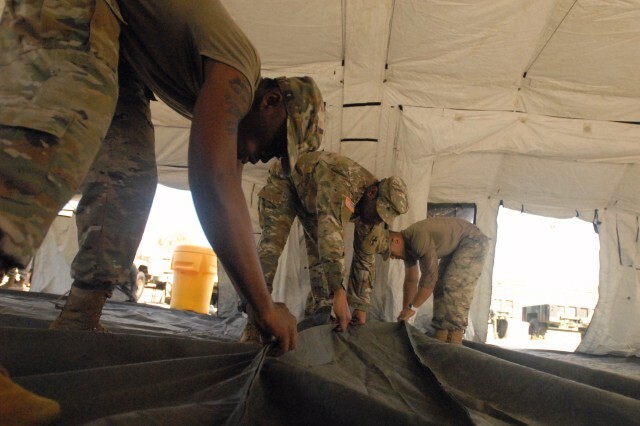 For some Soldiers, this was the first time training on the tent system. "I liked this experience. I learned a few things," said Pvt. Bryce Johnson. "I learned how to repair these tents, how to build them up, what parts went where, and overall the comradery was amazing as well." 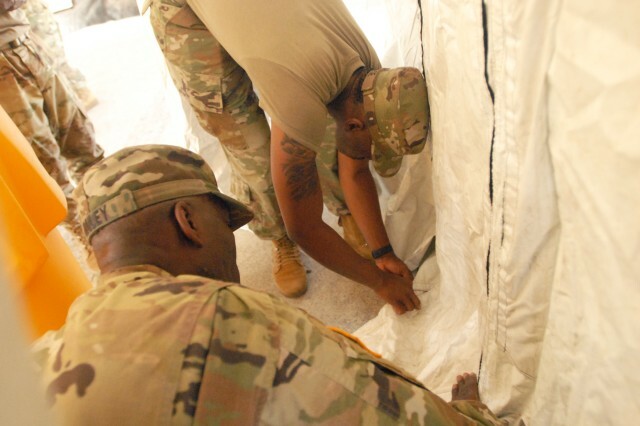 Under the supervision of subject matter experts from HDT Base X-Shelters Company, Soldiers were able to properly set-up and tear down all components of the tents. The training started with an inventory and orientation class of the equipment assigned to each of their sections followed by the set-up and tear down of the tents through a step-by-step process given by HDT subject matter experts. 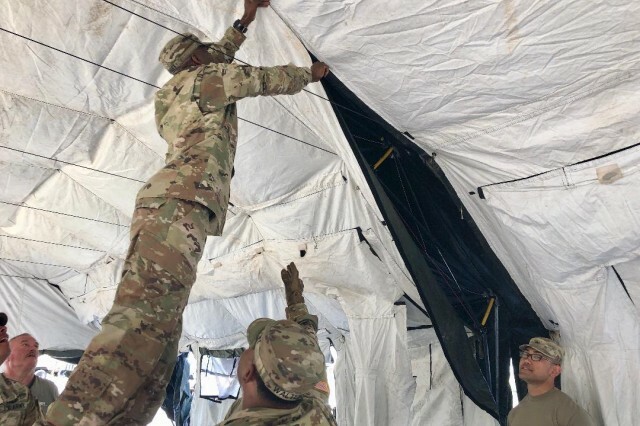 The training was the first building block to ensure that the 8th TSC's headquarters is able to deploy on limited notice with the right operational equipment to support contingency operations.